Since launching in the United States in 2012, the Choosing Wisely campaign has spread further than was expected, but now faces the challenge of demonstrating its “effectiveness in improving outcomes and making a difference on measures of quality and safety that matter to clinicians and patients”. That is the verdict of an article in the May 15 edition of JAMA examining the impact of this movement to tackle overuse of tests, treatments and procedures, which has now spread to more than 20 countries. Daniel Wolfson, one of the article’s authors and a prominent figure in the Choosing Wisely movement internationally, is a keynote speaker at the 2018 Choosing Wisely Australia National Meeting in Canberra next Wednesday (30 May). 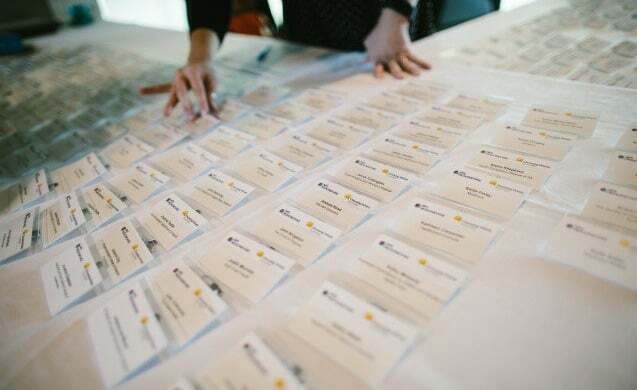 The second such annual event, the meeting will provide “an opportunity for health professionals, consumers, researchers, funders and policy makers to come together to discuss, engage and network on topics related to reducing unnecessary care”. Jennifer Doggett, who will cover #OktoAsk2018 for the Croakey Conference News Service, spoke this week with Daniel Wolfson, Executive Vice President and Chief Operating Officer of the not-for-profit ABIM Foundation, about the importance of grass roots and relationship-based approaches, amongst other topics. 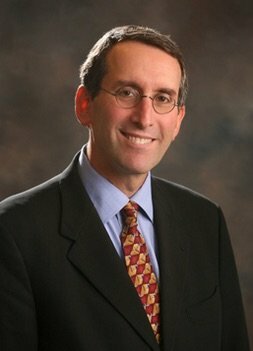 Daniel Wolfson has been involved with Choosing Wisely in the USA since its inception in 2012 and is a passionate advocate for this unique and profession-led campaign. “Choosing Wisely arose from an initiative that asked speciality societies to nominate five practices within their speciality that harmed rather than benefitted patients. This led to a broader campaign focussed on reducing low value or harmful care,” Wolfson explained. “From its inception Choosing Wisely has been led by clinicians and strongly based within the context of medical practice. This is one important reason for its success. It takes into account factors often ignored when trying to impose changes to health care, such as respect for clinicians’ professionalism and the dynamics and power relations that characterise medical consultations,” he said. Instead of being driven by rigid goals and targets, Wolfson explained that Choosing Wisely is guided by a set of health care principles. These include the importance of evidence, transparent decision-making and informed choices. These are values shared by both providers and consumers and Choosing Wisely seeks to align these values through messages such as ‘more is not better’ and ‘quality over quantity’. Supporting consumers to become more active participants in their care is a key component of Choosing Wisely. “Patient education and the development of information resources targeting consumers has been a major feature of the campaign in the US. The overall aim of this is to even the playing field and address the information asymmetry that so often characterises medical consultations,” Wolfson said. Wolfson praised the role of NPS MedicineWise in implementing Choosing Wisely Australia and stressed how lucky Australia is to have the organisation. In particular, he identified its national scope and ability to both disseminate advice on quality improvement and provide infrastructure support as valuable contributors to its success. He also highlighted the importance of NPS MedicineWise collecting national data to assess the success of Choosing Wisely Australia’s strategies, enabling national sharing of information and practices. This, he said, “increases uptake and awareness and helps promote successful changes”, and will add to the success of Choosing Wisely Australia in driving positive changes. There is some impressive evidence that Choosing Wisely has been successful at a local level in the USA, in particular in relation to the use of antibiotics, imaging and laboratory tests. However, due to the fragmented health system in the USA, there is no national data on its impact. This is why Wolfson is keen for Australia to take the lead in evaluating the impact of Choosing Wisely Australia on a national scale. Wolfson identified one of the key differences in the approach to Choosing Wisely between Australia and USA as the ‘collective approach’ to health care in Australia. He attributes this largely to our public health care system which fosters community ownership of the health system, rather than the more individualistic, ‘n=1’ culture in the USA. Wolfson said one of the main challenges to implementation of Choosing Wisely in the USA was the challenge of reaching the diversity of medical practices, many of which are small and operate independently of larger hospital and health care networks. Clearly a per capita funding system, where funding is allocated based on patient numbers and includes both quality and process measures, is better than a volume or time-based funding system. One of the next priorities for Choosing Wisely in the USA is implementing the campaign in disadvantaged and minority populations. Interestingly, Wolfson reported that research indicates that the ratio of low value care to appropriate care in populations under-served by the health system is around the same as that for the general population. However, due to the lack of trust that often exists between disadvantaged communities and mainstream health services, the ‘Choosing Wisely conversation’ between providers and consumers might focus more on how to provide optimal care, rather than on reducing unnecessary care. Another current focus of Choosing Wisely in the USA is to work at a state level on establishing statewide learning collaboratives to develop a regional approach to reducing low value and unnecessary care. This has the benefit that consumers in the region hear a consistent message from their health care providers, which strengthens the overall impact of the campaign and accelerates change. 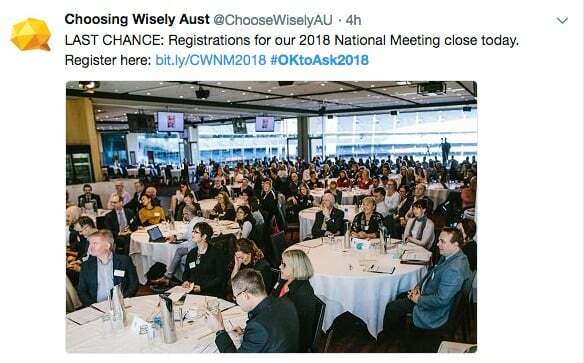 • Follow #OktoAsk2018 for more news from Daniel Wolfson’s presentation to the Choosing Wisely Australia National Meeting in Canberra next week. • Here is some pre-reading, with this compilation of Marie McInerney’s stories from a national meeting in Melbourne last year marking the second anniversary of the Choosing Wisely initiative in Australia.